Regular readers might recognise this plaque, as I’ve mentioned it before. I’m mentioning it again because it’s relevant to a current debate. ‘By the tree’ used to be ‘a great place to meet mates’, as this plaque records. 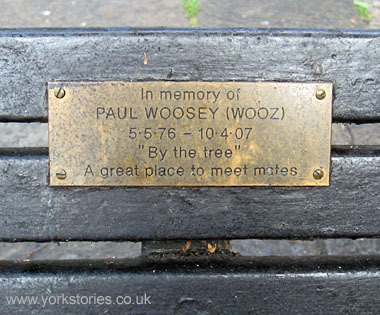 It’s in memory of someone called Paul Woosey, whose nickname was Wooz. He was born in 1976 and died in 2007. I didn’t know him. I just know from this plaque that he used to meet his mates by the tree. I assume his friends and family had this plaque put here. I went into town earlier and sat for a while on his bench to have a think before coming home to write this page. You may be wondering where this plaque is, might not have noticed it. It’s in the square we all love so much, King’s Square — on the bench by the tree nearest to the junction with Newgate and the Shambles. The plaque’s not that easy to spot, as like the rest of the square it’s really dirty. I didn’t see it until relatively recently. So I wouldn’t blame anyone for not noticing. Unless, that is, they were going round, as part of the ‘Reinvigorate York’ team, doing an audit of the existing features and a carefully considered redesign of the area, which was supposed to be retaining things of value, and was supposed to be for residents as well as visitors. Then I would expect them not only to have noticed it, but to have gone out of their way to contact the family or friends of the deceased, if they were planning to remove and replace the benches, which they are. The repaving work is just part of the ‘Reinvigorate York’ scheme. The rest of it involves removing ‘clutter’ and turning King’s Square into a ‘world class space’. It also involves replacing benches with benches of a standard type. It also apparently involves chucking plaques placed in memory of former York residents into a skip? Or perhaps recycling the metal? Or perhaps removing them and losing them? What were they planning to do exactly? I was curious. So, some months after first thinking about this, and in response to the current concerns over the ‘reinvigoration’ of this place, I emailed today to ask. The relevant council team/department is apparently unaware of this plaque. Which tells me all I need to know about Reinvigorate York, if I didn’t know already. For residents? No it isn’t. Respecting this ‘special and unique place’? No it isn’t. Like I said, I didn’t know Paul Woosey, I know nothing about this plaque apart from what it tells me. What it tells me is part of what makes this ‘special and unique place’ special and unique. So under ‘Reinvigorate York’, residents’ money is to be used to erase the traces/markers of recent residents and their special and unique connections? Not my idea of respecting and valuing a sense of place. It’s just small and indistinct, this plaque, it’s a marker of the life of one ordinary resident, whose life I could find no other record of in online records (apart from the official birth and death records) because he wasn’t famous. So he doesn’t have a statue, or a memorial in the Minster, or any of the other markers of greatness. He was I guess just an ordinary person like me and like most York residents. He has a plaque on a bench in King’s Square. Which no one involved in ‘Reinvigorate York’ cares about. Who was Paul Woosey? As the ‘reinvigoration’ is about to remove the marker of his life his friends might remember him by in that particular place, I hope that someone who knew him or who knows more about that plaque will claim a seat here, in the virtual sense, via the comments box below, and tell us about Paul Woosey. You can of course also use the comments box to make more general comments (as long as we all shift along the bench if Paul’s friends come along … But it’s an imaginary bench here in the virtual world, so it can extend for as long as we want it to). I can also be contacted via email. First mentioned in June 2013: Benches in King’s Square. The quote about the square being a ‘special and unique place’ is part of the council’s response to a query regarding the Sound Effect bench, also marked with a plaque. We saved the bench, for now at least. It’s still in the square after the ‘Phase 1′ work. I’m hoping ‘Phase 2′, if it really is about acknowledging the special and unique aspects of place, will involve not only keeping the plaque but perhaps popping in to the Barnitts shop across the square to buy a tin of Brasso to clean it up a bit. mmmm Reinvigorate York..why didn’t William of Normandy think of that catchy title ? This is a great article, and very sad. How absolutely thoughtless and clinical of the planning team to overlook this. I hope they take note and try to identify and contact the family / friends that organised the memorial bench. They have taken note, and the bench and plaque are still there (see the Update, above). I’ve also been told that if the bench is replaced the plaque will be placed on the new bench. I had a brief email from Paul’s brother so I know he has seen this page. I’ve also since had a couple of emails from people who knew Paul. I have wondered if other benches with plaques have been removed. Could find no record of a council policy regarding how long plaques are in place for. Other councils seem to have these, so that when you pay for a plaque it’s for a certain number of years. “I have lived in York all my life and a friend who died in his teens has a bench there dedicated to his name as we used to meet there each Saturday as kids. So instead of occasionally sitting on the bench reminiscing looking at a square that hasn’t changed for years, we now get to sit there and look at a square that could be in any city in the UK. Disgrace! I wonder what happened to this bench? Wasn’t in the square when I took the photo above. Does anyone remember it or know what happened to it? Perhaps the council kept the plaque and intend to put it on a new bench. Perhaps the family of the young man mentioned were contacted. I hope so.